Iowa first responders turned to a new colleague when searching for missing boaters Wednesday night. A 20-person team was searching for a grandfather and granddaughter who were stranded in a logjam on the East Fork of the Des Moines River. 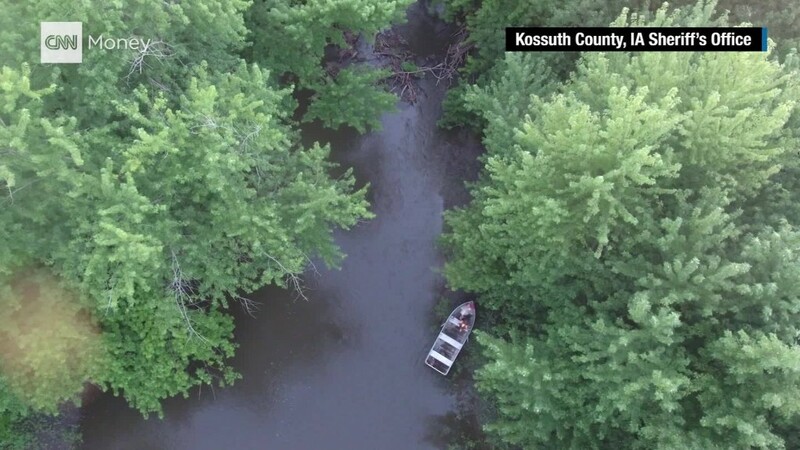 David Penton, emergency management coordinator for Kossuth County, could faintly hear the cries of the missing persons, but the setting sun was making it more difficult to see them amid the thickly wooded riverbank. So Penton called a colleague and had him rush to the scene with a drone. Within three minutes of takeoff, they'd found the duo by watching the live stream from the DJI Phantom's camera. The drone then hovered overhead so that the first responders could use its location to guide them to the grandfather and granddaughter. Penton said he expected the victims would have been found without the drone, but using it allowed them to find them faster. Once discovered, the man fell to his knees as he was suffering from a heart attack. "Without the help of that drone, time could've been an issue for him," Penton said. The man, Thomas Fitzpatrick, was rushed to a hospital. Penton said late Thursday that Fitzpatrick was expected to be upgraded from critical to stable condition. Drones are proving valuable to people such as Penton, who can benefit from inexpensive aerial photos and videos. Drones are expected to become increasingly common in August as the federal government's rules for commercial drone use will go into effect. The drone industry estimates that by 2025, drones will lead to 100,000 new jobs and an economic impact of $82 billion. Since acquiring the drone in May, Penton had only used it in test flights. He said the drone performed so well that he plans to get a second one. The drone Penton relied on -- a DJI Phantom -- weighs three pounds and costs about $1,000. "It gave that patient or that victim reassurance that they have been found," Penton said of the missing persons first seeing a drone hovering overhead. "We're here. We've rolled out every asset that we have to find them."